Bright fresh crunch in an easy big salad! 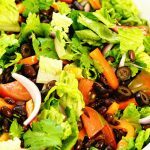 This southwest salad recipe takes just minutes to make and is topped with an simple homemade vinaigrette, this is an easy and delicious salad! Open the can of beans, rinse well under cold water and allow to drain completely. Tear or dice the greens into bite sized pieces. Slice the red onion and bell pepper. Cut the tomato into small wedges. Add everything to a large bowl and top with homemade vinaigrette.